Hi, I'm no expert but I have done a bit of card weaving. 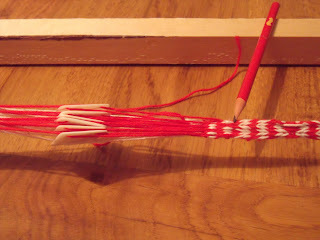 I think that you need to beat your weft in a bit more - it should look tighter along the length of the weaving. This will give a sharper design and should hide the weft better. Amalie at http://thewarpfactor.blogspot.com/ might be worth contacting, she's done a lot more weaving than I have. I may be confused, but the incorrect red bits actually look more like warp threads that weren't cleared properly. I am trying to determine if you are doing a double face weaving pattern... one where white would be on oneside and red on the other. if this is so, you should only be turning the cards twice in one direction. then reversing and going twice again... and so on. Your tablets are threaded s, s, z, z, s, s - and that means that when you turn them all in one direction, the slant of the threads changes where threading direction changes. This, in turn, means that when you change turning direction, the different slant between the s and z tablets will leave a little gap between them and will show your weft thread. I had wondered about that myself (I had a little spot of weft thread in my symmetrical twill patterns when I changed turn direction) and only learned the why from Sarah Goslee's talk at the Textilforum in Eindhoven. She has put her talk online at http://www.stringpage.com/tf2009/tf2009.html - I hope that explains it, if I didn't manage to make it clear here! The instructions indicate to "Turn the entire pack continuously forward. If you need to, reverse and turn the whole pack backwards; there is an example of exactly this reversal in the original braid." It could be that the reason there is no frequent reversal of direction of the tablets in this pattern is due to the technical issue described by "A stitch in time" in the comment above. I also wonder whether in the original, the weft also shows at the turning point.. Anyway, I'm going to print out your comments and give it another try! ps: your comments helped me describe my problem more clearly, so I added some extra details in the original post. Thanks! You will always see some of the weft at the reversal point. Beating your weft very tightly, and other types of thread, will make this less obvious, but it is the nature of TW. Which is why many people, when doing a some designs, choose to not reverse the turning direction when the twist builds up too much, but to untie the warp and work out the twist. Others just leave it until they really can't go in the same direction any longer, which means they only have one or two reversal along a whole length. This reversal also helps to make some designs. The easiest way to hide it on that particular piece is to ensure that you only change the direction of turning when your red will appear on the band - then the red weft won't stand out. I know a couple of people have already said it... but this is one of those "not a bug, but a feature" sort of issues with tablet weaving. You get it with any technique where the tablets are threaded in opposite directions, whenever you change turning direction. I usually work with all my tablets threaded one direction, so I don't have this particular issue often. U think you are doing a good job...very nice to take up such nice tutorials and impose projects for a pastime or a hobby.